Don't miss the chance to visit the world's largest movie studio and theme park! At Universal Studios Hollywood there's a world of fun-filled adventures the whole family will love. Take the world-famous Studio Tour, experience thrills and spills on exciting themed rides. Face heart-pounding special effects at every turn on Revenge of the Mummy - The Ride. Add a classic Hollywood finish to your day at Universal CityWalk®, more than 30 places to eat, a hot nightclub, 19 screen theater with state of the art IMAX® and more than 30 unique shops. It’s LA’s favorite place to play. CityWalk is located directly next to Universal Studios Hollywood. Upgrade your ticket to the express option and avoid any upset on the day of. Get ready for the ultimate Hollywood movie experience! Priority entry privileges, reserved seating, special demonstrations and special tours are subject to ride, show and attraction availability. 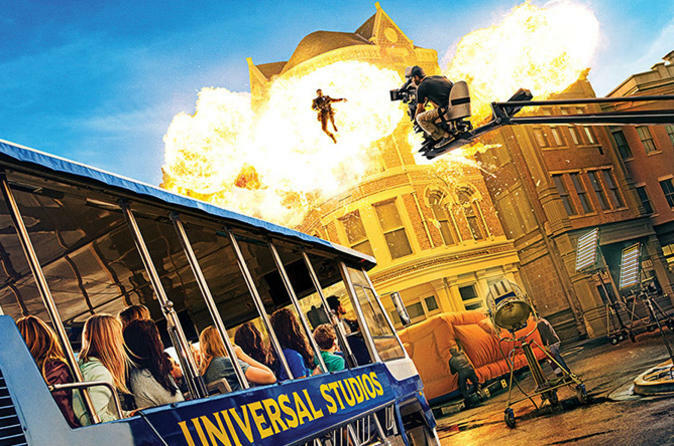 A Universal Express Ticket at Universal Studios Hollywood entitles pass-holders to one-time express access to each ride, show and attraction.